No other city has such a diversity of people and cultures as New York City. Within the boundaries of its five boroughs lies a microcosm of the whole world. Visitors can move along the bustling sidewalks of Chinatown, visit the Greek tavernas of Astoria, the Old World Russian restaurants and clubs of Brighton Beach, the Italian communities of Little Italy and Arthur Avenue, the sari shops of Little India in Jackson Heights, and so much more. This city of contrasts also contains the SoHo section, with its stylish art galleries, boutiques, and bistros housed in historic cast iron buildings among cobblestone streets. Manhattan is 12 miles long and 3 miles wide. Its streets run east and west and its avenues run north and south. The east side covers everything east of Fifth Avenue; the West side everything to the west. 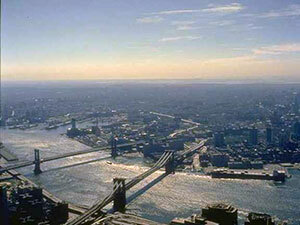 Most of New York’s best known tourist attractions are concentrated in Manhattan. Brooklyn was a separate city until 1898. It has its own civic centers, cultural institutions, shopping district and residential neighborhoods. Its major attractions include: Brooklyn Botanical Gardens, The Brooklyn Museum, Brooklyn Academy of Music, Aquarium for Wildlife Conservation and Coney Island. Queens is a largely residential borough and one of the most ethnically diverse areas of the city. Neighborhoods include Greek Astoria, Latino Jackson Heights, Asian Flushing. Flushing Meadow-Corona Park and Shea Stadium are major attractions. The Bronx is the only borough connected to the mainland. It contains some of the city’s largest parks, including: the Bronx Zoo, New York Botanical Garden, VanCortlandt Park, Pelham Bay Park and a place called Yankee Stadium. Staten Island (also known as Richmond) is the most rural of the boroughs. Its major visitor attractions are historic Richmond town, The Jacques Marchais Museum of Tibetan Art, Staten Island Botanical Garden, the Alice Austen House Museum, and the Staten Island ferry.